The following guest post was written by Donald A. Murk, PhD, Chair of the Education Department and Professor of Early Childhood Education at Messiah College in Mechanicsburg, Pa. He is beginning his 35th year at the college. Dr. Murk writes about the Together for Tomorrow Project, and how it has impacted Downey Elementary School in Harrisburg School District (PA). Dr. Sybil Knight-Burney, Superintendent of this school district, is an AASA member. We learned about TFT at the June 2016 “Every Student, Every Day National Conference: Eliminating Chronic Absenteeism by Implementing and Strengthening Cross-Sector Systems of Support for All Students,” sponsored by the U.S. Departments of Education, Health and Human Services, Housing and Urban Development, and Justice. AASA Children’s Programs Department organized and moderated a panel at this conference entitled Together for Tomorrow: Top Down Leadership to Address Chronic Absenteeism. This panel featured AASA member Dr. Sybil Knight-Burney, superintendent of Harrisburg School District (PA), alongside Mr. Travis Peck, principal at Downey Elementary and this week’s guest poster, Dr. Donald Murk. Department member, Kayla Jackson, moderated this session. (Pictured L-R): Travis Peck, Principal, Downey School, Harrisburg, Pa.; Dr. Donald Murk, Chair, Department of Education and Professor of Early Childhood Education, Messiah College, Mechanicsburg, Pa.; Kayla Jackson, Project Director, AASA, Alexandria, Va; Dr. Sybil Knight-Burney, Superintendent, Harrisburg School District, Harrisburg, Pa..
School reform/renewal is a hot topic in education. What helps failing schools improve? How do we get children engaged in their learning? How do we get the community involved in public education? Research suggests that partnerships between schools and nearby universities/colleges are one way toward reaching these goals. The partnership described in this article has been in the making for 34 years. You see, I did my student teaching at Downey in 1978/79. Some might say the stars aligned, or that the timing was right.. However you define it, this dynamic partnership benefits all parties and the excitement from the teachers, parents, and students is contagious. Businesses, churches, and individuals are beginning to recognize the power of this partnership and want to be connected. Focus community partnerships on boosting key measurable student outcomes – Attendance, Behavior, Course performance, and College access (the ABCs) – as a means to improve low-performing schools. Our local initiative is a collaboration between Messiah College (Mechanicsburg, Pa.), Harrisburg School District and Downey Elementary School (Harrisburg, Pa.). This partnership would not be possible without the support of Dr. Sybil Knight-Burney, Superintendent of the Harrisburg School District, Mr. Travis Peck, Principal at Downey, and the Harrisburg Public Schools Foundation. Downey Elementary is the first Harrisburg site for TFT . Teachers lead three focal point groups so that they are able to ensure the TFT efforts are supporting student achievement. The development of initiative objectives with help from students, parents, and the community, are focused on boosting key measurable student outcomes, closing the achievement gap and supporting overall student success. The focal point groups contain talented individuals who wish to support the effort through attributes in their field of involvement. There is a steering committee of Downey School representatives from each focal point group. Student Achievement is the main goal of the TFT initiative. By participating in the decision making process, students are empowered to become leaders who are aware of their importance and contribution in society. The community partnerships that are being established will help to strengthen the school. As the community becomes involved in the school, more opportunities will open up for the students. Not simply monetarily, but through community involvement in the school through mentoring and classroom participation. 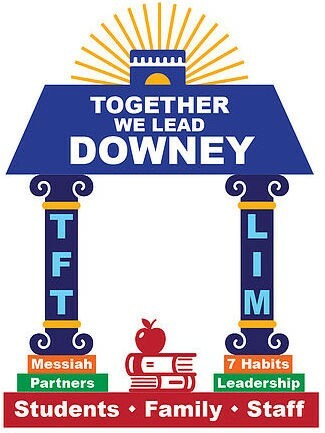 Downey is also a “Leader in Me” school and the habits fit well into the goals of the school. The Leader in Me is Franklin Covey’s whole school transformation process. It teaches 21st century leadership and life skills to students and creates a culture of student empowerment based on the idea that every child can be a leader. The 7 Habits is a synthesis of universal, timeless principles of personal and interpersonal effectiveness, such as responsibility, vision, integrity, teamwork, collaboration and renewal, which are secular in nature and common to all people and cultures. Measuring success is difficult. People want dramatic results. Here are a few measurements that show improvement. Students are excited about coming to school and more importantly, they are excited about learning! Innovative and exciting things are happening at Downey. I cannot wait to see the promise of success for the new school year! ** Citation: Boyer, Ernest Ready to Learn: A Mandate for the Nation. New Jersey: The Carnegie Foundation for the Advancement of Teaching, 1991.